When making the lighted glass blocks, are the diamond bits round like a hole saw? Can a 3/4 size work? We have made some but have used a bit shaped like an arrow head. Is the round one the correct one to use? My experience is that you need to use a diamond bit which can be purchased at a home improvement store or hardware store. My husband uses the "arrowhead" type of bit to drill the beginnings of the hole because it just makes it easier to drill the actual hole. Be sure to keep your bit cool by using cool water drops at the drill site. We suggest you drill for a few seconds and stop to cool the bit and then begin again. I had originally used a 1/2" bit but have found that 3/4" works better for inserting the lights. At first I was trying to put the lights into the block light tip first and then I discovered inserting them in base first worked much better. The biggest problem I have had was not breaking the glass, but cleaning out the dust once the hole was drilled. I've read on this thread that someone used rice inside the block with some water and shook it around to clean out the dust, but, I did not find that to work for me. However, maybe I did something incorrectly. Now I just put a drop of liquid dish detergent in the hole and fill it with hot water and let it set for a few minutes. Then I use a long handled brush, similar to the ones we used to use to clean out glass baby bottles years ago. I think I found it at a Dollar store. One more thing, until a few days ago I had no problem with the lights I had purchased. However, somehow I bought a box of lights that had a connector on each end. 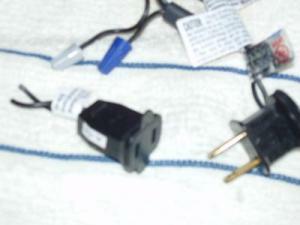 One end had the prongs to fit into a receptacle and the other had only the receptacle for prongs to be inserted. Of course, neither of those ends will go through the hole so I wound up cutting the wires to the end without prongs, stripping back the wire a little and putting wire nuts on each strip of wire.